Talking about the 5th Station of Mt. Fuji hillside, let’s start with the weather there. 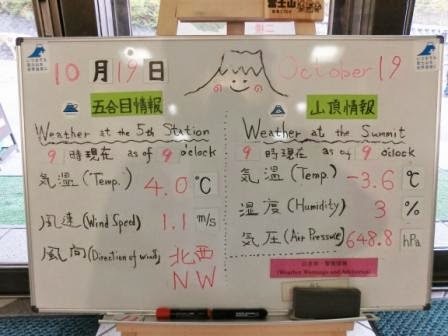 Look at this white board in Sky Palace Fuji, one of the information centers in the 5th Station. 4 degrees in October! That’s how Mt. Fuji has got fall leaves and the first snow so early. It’s autumn in Tokyo and Lake Kawaguchi, and it’s winter in the hillside of Mt. Fuji. The 5th Station is a place for very casual sightseeing as well as hiking. You can go sightseeing there even in high heels, but make sure to take warm clothing. I was right to wear a coat. There is a small but beautiful shrine in the 5th Station. 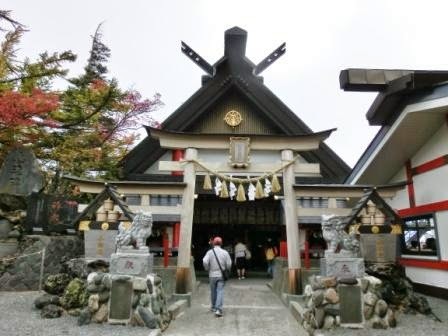 In Japan, there has been a culture to respect a mountain as a spiritual spot since old times. It is said that Mt. Komitake was a mountain that existed before Mt. Fuji of today, and that a shrine was established as a place to pray more than 1000 years ago. When you go inside and out from another gate on your right, there is an observation deck where you can see Lake Yamanaka, and the sunrise in the morning when you stay at a lodge in summer season. The scenery is in the last post and Flickr of Tokyo Direct Diary. A written oracle of Komitake Shrine. 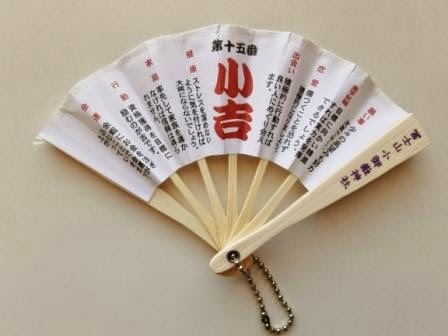 Amazingly, its shape is a folding fan! It’s all written in Japanese, but surely the purple letters say, “Mt. 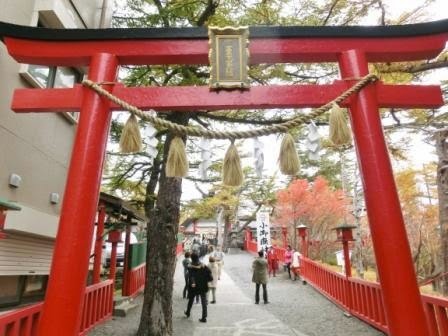 Fuji Komitake Shrine.” The short chain enables you to bind to your backpack. I don’t see this on guidebooks, but I recommend it! When you have lunch, there are some Mt. Fuji-featured menu. This is one of them, Ramen bowl (Chinese-originated noodle.) The black thing is dry seaweeds. It has a Mt. Fuji printing! 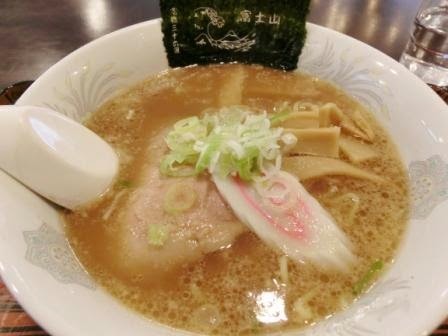 There are also curry rice, other Japanese noodles, etc. I saw many people having Japanese Udon noodle bowls. It’s cold outside, so everyone wants a warm meal! Mt. 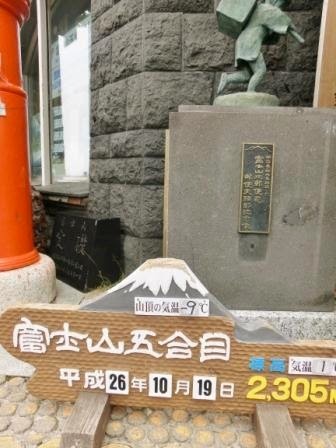 Fuji 5th Station Post Office helps you with sending Mt. Fuji post cards. To send postcards, buy your favorite ones and ask to send them at the counter. Panoramic post cards are good, and if you like, wooden cards are fine, too. It costs several hundred yen to send your favorite card internationally. Outside of the post office, it’s one of the photo spots in the 5th Station. The red thing is an old Japanese postbox. There are some sculptures of old Japanese climbers as well, so tourists are excited to take photos here. Of course, there are more photo spots around. The district around Mt. 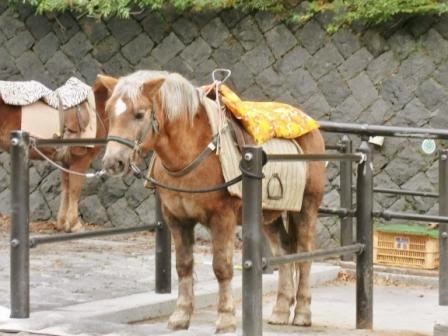 Fuji is a place for horse riding, and there are ponies in the 5th Station. They will take you to some places with great views and return. In summer, there is also a course that the ponies take you to the 7th Station. To explore more, please wait for another post and Flickr updates. Thank you for reading and have a happy travel with Tokyo Direct Guide! By Train: The major way is to take JR Chuo Line Express from Shinjuku, change trains into Fujikyu Line at Otsuki Station and go to Mt. Fuji Station or Lake Kawaguchi (=Kawaguchiko) Station. It takes 2 hours from Shinjuku to Lake Kawaguchi. By Bus: There are some fast buses from Shinjuku, Tokyo Station, Shinagawa, Haneda Airport, etc. The ways to Mt. Fuji are quite complicated even for a Tokyo local, so it is a good idea to find a tour. There are also discount train tickets by JR and Fujikyu Railway. Fujikyu Hiking Bus from Mt. Fuji or Kawaguchi-ko Station: 2,100 yen for return ticket. Around 1 hour. in high season, there are more buses than other seasons. Major way to visit Mt. Fuji 5th Station. Fujikyu Highway Bus from Shinjuku, Tokyo 2,700 yen for single ticket. Around 2 hours and half. In Yamanashi Prefecture and Shizuoka Prefecture. Yamanashi Prefecture is right west from Tokyo. Mt. Fuji and Lake Kawaguchi are not places of world wide hotels such as Hilton, but there are some 5-star superb hotels of traditional Ryokan style. Most of them feature hot spring bathes (Onsen in Japanese) with the stunning views of Mt. Fuji. I picked up some fabulous hotels with high ratings. Kozantei Ubuya – Winner of the 2014 TripAdvisor Traveler’s Choice Award. Fujikawaguchiko Onsen Konanso – A 5-star, traditional style, lakeside hotel. Convenient to go to the attractions near Lake Kawaguchi and the station. Shuhokaku Kogetsu – You can expect to see Mt. Fuji itself and Mt. Fuji reflected on Lake Kawaguchi on calm sunny days. The views are breathtaking. Highland Resort Hotel & Spa – A great hotel right next to Fujikyu Highland, the amusement park owned by Fujikyu Railway. I talk about cities mostly, and sometimes "mild" nature, but the entire of Japan is mountainous lands with many volcanoes. It's pretty surprising, isn't it? Autumn leaves told me that it was still autumn, but I remember that it got colder and colder on the bus to the 5th Station. And at the moment I stepped out to the outside, I pulled on my gloves! I felt that we can't underestimate nature in any travel. Have a nice travel with preparations!